A startup that emerged from the UC San Diego electrical and computer engineering department took first place and $10,000 this week in the latest competition of the Triton Innovation Challenge, an annual UC San Diego business competition for environmentally focused technologies. The team, BIC LIDAR, is working on compact, solid state lasers for LIDAR applications. For this competition, the team focused on their LIDAR system’s possible applications in wildfire detection in forestry. However, autonomous vehicles are among applications of this technology that have large potential markets. The researchers are aiming at size and price points that are significantly more compact and less expensive than today’s LIDAR technologies. 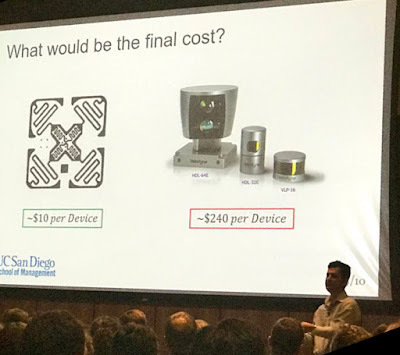 A slide from BIC LIDAR's presentation suggests they are going for $10/device compared to LIDAR currently on the market, which comes in at more than $200/device. Babak Bahari presenting at the Triton Innovation Challenge. The research came out of the lab of Jacobs School of Engineering electrical engineering professor Boubacar Kante. One of the key players in the startup is Babak Bahari, a fourth year graduate student at electrical and computer engineering department at the Jacobs School of Engineering. “We demonstrated the new laser based on completely new physics that enables us to surpass a fundamental technological barrier in LIDAR technology. With this laser, we can remove all mechanical components, shrink the size of LIDAR systems into the nano-scale, and increase the speed at least six orders of magnitude,” said Bahari. The solid state LIDAR team was one of the inaugural cohort of startups to be accepted into the technology accelerator launched by the UC San Diego Institute for the Global Entrepreneur in May 2017. Second place in the same competition went to E-Way, which is a collaboration led by Wei Huang, who is a Jacobs School materials science graduate student in Joanna McKittrick’s lab, and Alejandro Conde PhD, who is currently a Rady School MBA student. The Triton Innovation Challenge, now in its sixth year, is a business competition focused on fostering creativity and bringing to the spotlight commercially promising, environmentally focused technologies generated by the finest minds at UC San Diego. Supported through the generosity of The William and Kathryn Scripps Family Foundation Inc., the program is presented through a partnership of the Rady School of Management, Scripps Institution of Oceanography, and the Jacobs School of Engineering.